A 21st Century Vault Door with a 19th Century Look! The vault door you are looking at above was not manufactured 100 years ago. It is a new door that was developed by our factory over the past two years. The challenge put to our designers was to create a vault door that looked as if it was built in the late 1800s, yet had to be light enough to be transported by truck and installed in the same manner as contemporary style doors that are sold every day*. 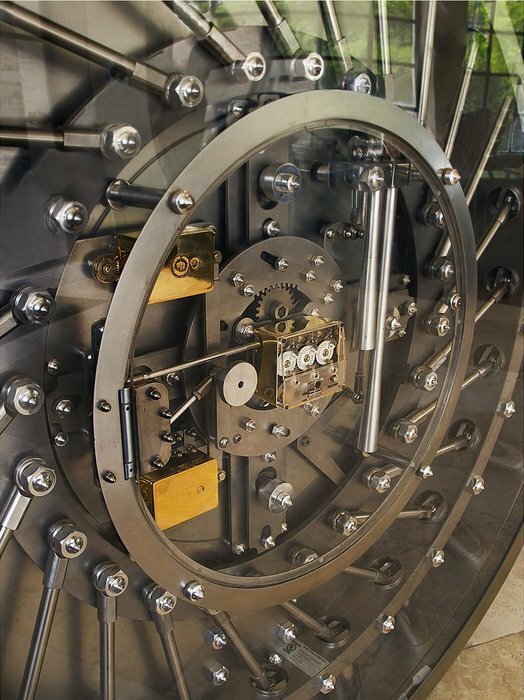 Once the door was designed and the prototype fabricated, the last and most important challenge had to be taken on: having Underwriters Laboratories test the door for the strongest certification awarded to burglary protection vault doors… UL Class 3. We are therefore pleased to present our new round door vault door that successfully passed the UL Class 3 performance test, with flying colors! That is, the door was designed to provide superior protection compared to the minimum security required to pass this difficult test. It was designed to provide the kind fo protection the leading USA and Lloyds insurance companies can rely on to provide coverage for their highest profile clients. The standard model is offered with a stainless steel finish with accents in 24 kt. gold and brass. Since each door is manufactured to order, our clients have the opportunity to request customization of some of the cosmetic parts of the vault door. An internal day gate is optional and can be supplied with a retro or other type of design… a variety of materials and finishes available. We have received inquiries from architects for applications ranging from the financial industry, fine jewelers and watchmakers, casinos and residences. We are now taking orders for this door. Complete details, specifications and dimensions are forthcoming. For those interested, additional information is available upon request. Please note that these doors were designed to fit onto UL listed modular systems or poured-in-place vault rooms (according to ASTM specs.) that provide the same level of security for insurance purposes. For more information about these vault rooms, please take a look at our complete selection under the “Vault Systems” heading. *Round door vault doors from the 1800s and 1900s weighed from 25,000 to over 75,000 lbs. and required special pits made in the floor so the doors could open and operate. Our door weighs only 9,000 lbs. and can be installed and operated on top of a flat surface.